Sure, watches aren’t exactly something people need nowadays. Most of us spend the majority of our time sitting at a desk, staring at the computer screen, with its own built-in clock. If we’re not at a desk, then we’re carrying our phones, which also has its own built-in clock. But, you see, wearing a watch isn’t it a need, it’s a want! All distinguished men should believe us when we say you want to be that guy that wears a watch. It doesn’t matter how many electronic gadgets you carry. Why, should you wear a watch? Here’s why. 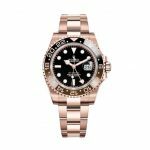 A watch communicates things such as, “I’ve got thing to do, places to go, and I am a refined and distinguished adult.” Below, we go over some of the best timepieces that you can find for under a grand. 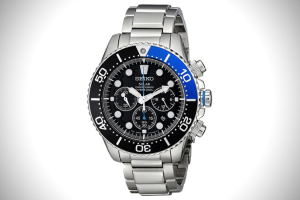 Seiko has been creating quality watches since it opened is first shop in Tokyo way back in 1881, so if you have just under $300 to spend, this Dive Watch is an insanely good bet. Made from stainless steel, it features a black and blue dial, a corrugated bezel, and solar quartz movement that charges the watch’s battery whenever it’s exposed to sunlight (read: you’ll never have to replace the battery). 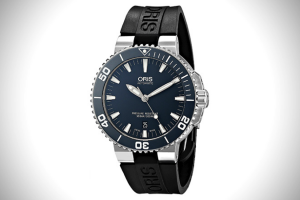 And, of course, because it’s a dive watch, it’s water-resistant for up to 660 feet, so you can wear it anywhere near water and not worry about ruining it. With Pennsylvania roots stretching back to the late 1800s, Hamilton is truly a part of Americana (even Elvis wore a Hamilton). This Field Watch is the perfect everyday watch—handsome, but not too flashy, with a classic stainless-steel case, brown leather band, and black face. 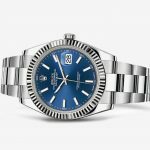 The market is crowded with venerable watch brands that have been around for hundreds of years, so it’s rare to see a young new upstart making waves. One of those young upstarts is Void—established in 2008 by a Swedish designer living in Hong Kong, Void creates whimsical, unique watches that are sure to get you attention at work and at play. The V03C Chronograph, in particular, is a good bet. It has an understated face and leather strap, but the watch’s main feature is the fact it has six hands that allow you to tell time down to split seconds. Who wants to race? Headquartered in Switzerland, Tissot has the distinction of being the brand behind the release of the very first mass-produced pocket watch in the mid-1800s. With a long history like that, investing in the brand is a smart move. This Heritage model looks like something out of your grandfather’s era (in a good way), with the classic brown crocodile band, stainless steel casing and accents, and date. 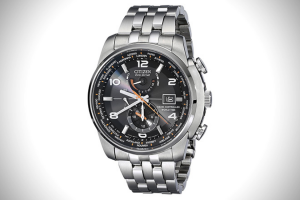 Similar to Seiko’s dive watch, Citizen’s Eco-Drive Watch is crafted out of stainless steel, fueled by Japanese quartz movement, and is water-resistant for up to 660 feet. The watch’s more unique features include an anti-reflective sapphire crystal face, and luminous orange hands, which means you’ll be able to tell time, even in the dark. Montreal-based Rossling & Co.’s watches are perfectly “middle of the road,” which means they can be dressed up or dressed down. 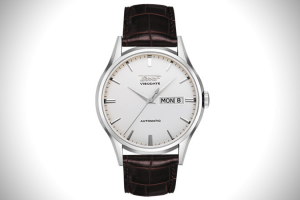 Their Automatic Silver & White watch would look just as good with a suit as it would with a t-shirt and jeans. 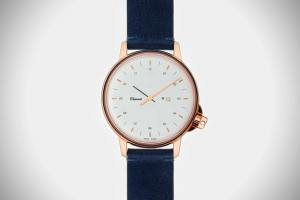 The watch’s classic white face is made unique with the midnight blue hands, but the most notable feature is the two-tone band—brown suede on the outside and blue leather on the inside. Miansai became the darling of the fashion world a few years back, when people couldn’t get enough of its preppy rope bracelets. Miansai since expanded to create additional wristwear in the form of watches, and we’re not complaining. The M12 Swiss Rose watch sports a high-class look with a low-profile, rose gold accents, classic white face, and blue Italian leather vintage strap (which is cut on an angle at the end for extra flare), which would pair excellently with a tailored navy suit. 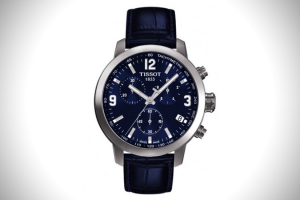 Another offering from Tissot, this all-blue chronograph is stunning and sporty at the same time, and the scratch-resistant sapphire crystal face means that it can look elegant while still taking a beating. A watch is a staple of your everyday wear, so what better brand to sport than one that has the word “constant” in its name? 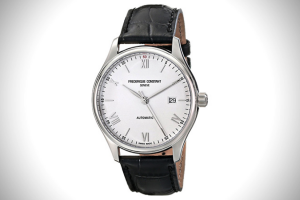 This Frederique Constant Automatic watch is crafted in Geneva, Switzerland—which is to watches as Silicon Valley is to computers—and has everything you’re looking for in a classic watch that you can wear everyday, anywhere. Mougin & Piquard was a legendary watchmaker from the late-1800s to the mid-1900s, and when they shuttered their business, their watches instantly became collector’s items among watch aficionados. Today, watchmaker Tourneau has paired up with J. 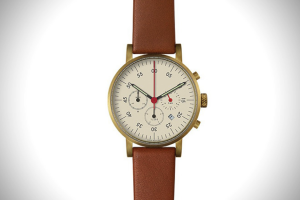 Crew to create this vintage replica of a Mougin & Piquard chronograph from the 1920s. 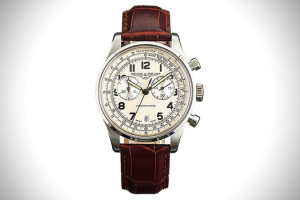 Featuring a mineral crystal face, a vintage leather strap, and intricately detailed chronographs, this is a watch worth investing in. 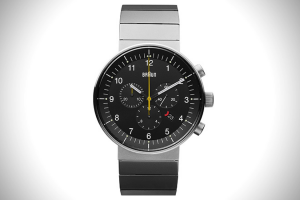 The Swiss always receive credit for making the best watches, but you can’t downplay classic German craftsmanship, which is featured here in this Braun Prestige Chronograph. The watch’s case was carved out of a single block of steel, which eliminates the need for a case-back and removes the potential for leakage (the watch is water-resistant up to 165 feet). 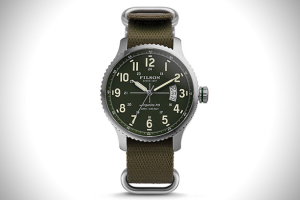 With roots back to the late 1800s, Filson is a true American heritage brand. Unlike some field watches that are “field watches” only in name, this one is built to stand up to whatever you throw at it. Featuring a coated, scratch-resistant face (with anti-glare coating thrown in for good measure) and a band made out of military-grade NATO nylon, this is a watch that will get you through any outdoorsy activities you have coming up. 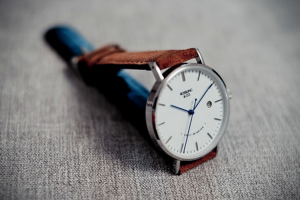 Sometimes you want a bulky chronograph watch, and sometimes you want a slim, minimalist watch to wear on special occasions. 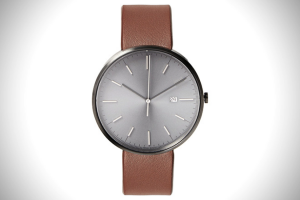 Uniform Wares’ M40 PVD falls into the latter category—with its elegant brushed steel case, silver face with no numbers, and buttery leather band, this is the watch you want to be wearing for your first day on the job or the first time you meet your girlfriend’s parents. 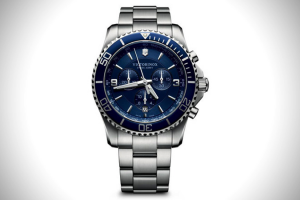 The Victorinox/Swiss Army brand is synonymous with the words “rugged” and “built-to-last” and the Maverick Chronograph embodies both of those descriptions while managing to look super elegant and more expensive than it actually is. With its stainless steel body, deep blue face (covered with triple-coated, anti-reflective sapphire crystal), unidirectional rotating bezel, this is a watch you’ll be proud to wear. 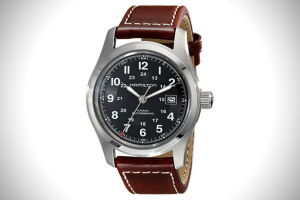 The Shinola shoe polish brand—well-known in the WWII era—was recently relaunched as a sought-after watch and leather goods brand based in hard scrabble Detroit. 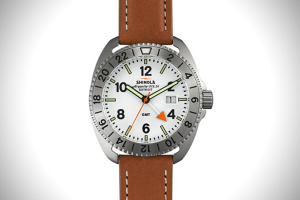 Shinola’s Rambler watch is its first offering that appeals directly to frequent travelers, with its 24-hour hand and its turning bezel that can keep accurate time when traveling across time zones. Pair those features with the classic designs and fun accents like the bright orange second hand, and it’s the perfect watch for any go on-the-go. As one of Shinola’s newest offerings, the Runwell Moon Phase watch is perfect for any guy who always has his eye on the sky. 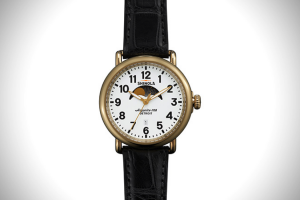 The whimsical design tracks the moon’s lunar phases from waxing to waning, and the gold-plated PVD-plated stainless-steel case and black alligator strap make it stand out from the crowd. 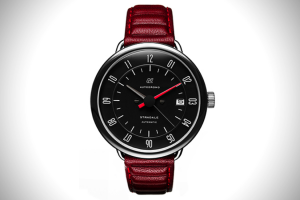 Any gearhead will immediately fall in love with the Autodromo Stradale watch, which apes the design of dashboard instruments of classic 1950s-era Italian sports cars. The domed sapphire crystal cover offers a unique three-dimensional look, and the gorgeous oxblood leather strap is beveled to be reminiscent of a sports car’s interior. You might not be able to afford a Ferrari, but you can afford this watch, which is almost as good. 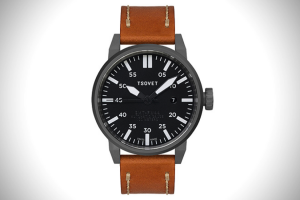 Inspired by the watches issued to WWI infantrymen, the Tsovet Automatic SMT-FW44 is housed within an aero-grade black stainless-steel case and has a leather band with exposed rugged stitching. It’s sharp enough to wear to a business meeting, but unique enough to make everyone around the conference table what your weekend plans are. Established in 1904, the legendary Swiss watchmaker is still creating incredible timepieces worth investing in. This watch, with a navy blue face and unidirectional rotating bezel, is elegant, but with its black rubber strap and water-resistance up to nearly 1,000 feet, it’s a lot tougher than it looks.